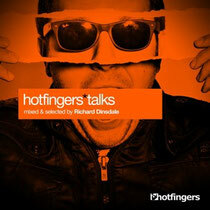 ‘Hotfingers Talks’ is a new compilation series by the Hotfingers Label. Out on February 1 2013, the album is selected and mixed by UK DJ/producer, Richard Dinsdale. Containing all exclusive material, the compilation includes originals by Richard himself, Betoko, Mario Piu, Alex Roque, Benny Royal, Mark Junior, Lazy Bug, Jairo Delli, Oliver Schmitz and remixes of Alex Kenji's Get Funky & Pleasurekraft. The aim of the series is to express the sounds and styles of the UK producer, the label and its various contributors. My spouse and I stumbled over here different website and thought I may as well check things out. I like what I see so i am just following you. Look forward to looking into your web page for a second time. Wonderful blog! Do you have any suggestions for aspiring writers? I'm hoping to start my own blog soon but I'm a little lost on everything. Would you suggest starting with a free platform like Wordpress or go for a paid option? There are so many choices out there that I'm totally overwhelmed .. Any recommendations? Kudos!